Richard Meier & Partners - Jesolo Immobiliare S.r.l. present JLV. Globally renowned architect Richard Meier introduces an unprecedented residential offering to the Venetian Coast. “I am creating a new concept of space for spending free time and holidays, using human dimensions as a unit of measure”. Jesolo Lido Village is composed of three distinctive components: The Pool Houses, The Beach Houses and The Hotel & SPA. Inspired by the intoxicating quality of the natural light, Richard Meier & Partners have designed a residential offering which blends modern architectural excel- lence with the beauty of the Adriatic seashore. 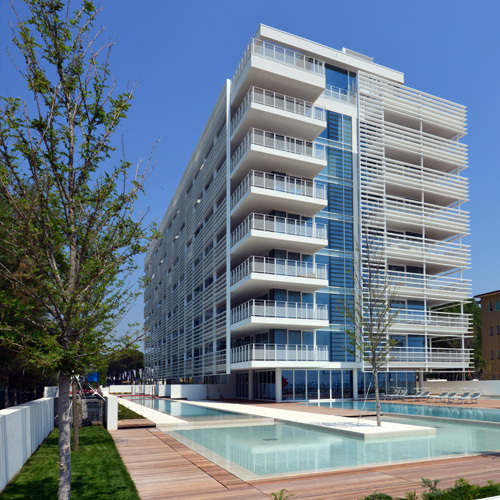 Jesolo Lido Village has already become the residential design icon of the Venetian coast.